The PAC Smart Biometric Reader integrates fingerprint technology by comparing it against a card template. This eliminates the need for a central database and communications infrastructure. 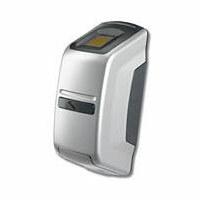 A contactless smart card reader and biometric finger scanner are combined into the unit. The unit reads a stored fingerprint template from the card together with the access control code and card number in one pass. Only when a finger is presented to the reader and it has been compared against a template from the card to give a match does it release the information for processing. Once the information has been processed the reader then either grants or denies access. This PAC Smart Biometric Reader is ideal for security areas where user identification and verification is of high importance. The reader prevents fraud and misuse, which increases the security of the building to the highest level available.